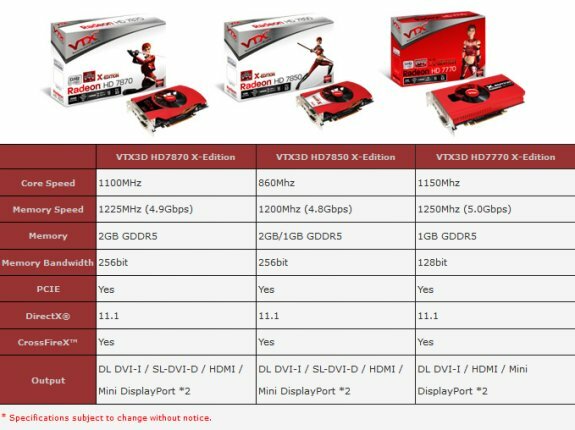 A leading brand of graphics card maker - VTX3D, today adds three new models, HD7870/7850/7770 into X-Edition series, which make this series more completed for OC enthusiast to choose. Being self-designed of VTX3D, these three models are designed to provide gamers the most extreme performance at its same class, also bring unbeatable HD gaming experience with DirectX® 11 support. Equipped with 2GB of GDDR5 memory, the HD7870 X-Edition clocks at 1100MHz for core and 1225MHz of memory speed. There are two types of memory size, 1GB and 2GB of GDDR5 for HD7850 X-Edition, and both with 860MHz/1200MHz for core and memory respectively. HD7770 X-Edition is fitted with 1GB of DDR5 memory clocked at 1150MHz of core and 1250MHz of memory speed. Based on the latest 28nm GPU technology, gamers benefit greatly by the support of AMD Eyefinity technology and AMD HD3D technology, which can make you feel the most “wrapped around” and HD gaming experience than ever. With AMD App Acceleration support, it can boost up the speed of communication between CPU and GPU, and enhance everyday tasks. Thanks to the AMD exclusively power technology, AMD PowerPlay technology, ensuring maximum GPU efficiency by dynamically scaling clocks speeds and power consumption in response to GPU loads.